Tom, Karl and I together again preparing for yet another adventure. We sat chatting and catching up on the porch of the lodge as if they had never left, giddy with excitement. This excitement of safari turns fully grown men into playful young boys – making the rest of the world, and its problems disappear in the vast expanse of the African bush. We were setting off on a 21-day hunt in Namibia’s famed Caprivi Strip, a quest for elephant, buffalo and crocodile. As you will read a few daily reports written below, it was the unexpected that would etch memories into our minds to remember for the rest of our existence. Returning to camp after freshening up the leopard bait, showered and cocktail in hand, I approached the dining area to find a local tribesman waiting for me. “We please need you to shoot us a hippo for the meeting this weekend”, he said. I asked him to please wait for the clients so I could discuss it with them. When Tom and Karl arrived, and gin-and-tonic and white wine served, we started the discussion. 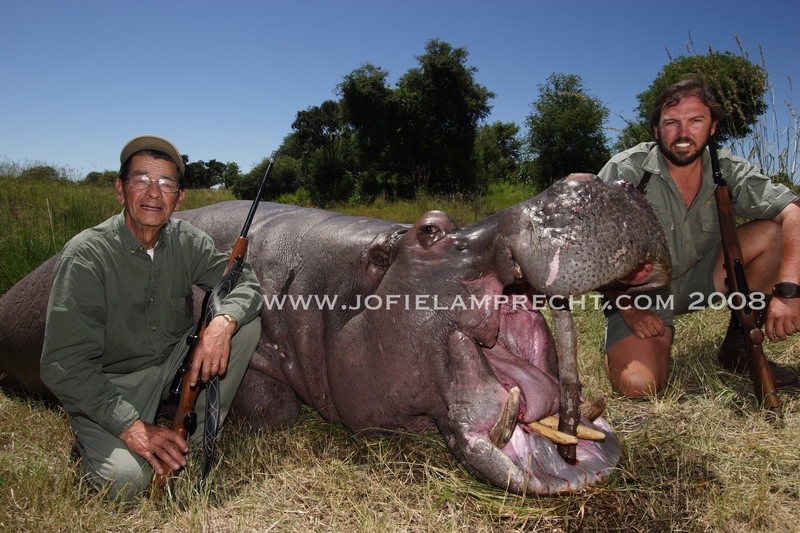 Tom wanted to concentrate on elephant with Koos, the owner of the concession and hunting camp. Karl stated, “Are you even asking me?” Tom, Karl and I had been on many adventures, with Karl willing to shoot at anything I pointed him at. “After our blind session for Mr. Spots in the morning, we go to the river”. Off to the leopard blind at 3 A.M. again, a one and a half-hour drive toward the Zambian border. No Mr. Spots. He has not eaten for two days and we were worried that he may not return. At 8 A.M. we took a government ranger boat down the Kwando River in search of a hippo for the local tribal meeting and party. The river is beautiful, lethargically making its way down sharp bends and narrowed in places by reeds and papyrus. We see reedbuck, large herds of red lechwe as well as a huge variety of bird life – malachite kingfishers, carmine bee-eaters, bateleur and many more. It was paradise in one venue. The target being hippo, we cruised slowly down stream in search of what the Germans call a “river-horse”, and they proved very elusive. After a few brief encounters, with the target in sight, they slipped under water and galloped to the safety of the reeds. This happened all underwater, with no chance for a shot. The river was at record high levels, making hunting very difficult. We finally resorted to cutting the engine every time bubbles were spotted ahead, crashed the boat into some reeds for stability, and waited. Our persistence paid off, with a bull coming to the surface to investigate about 30 yards away. He turned to face us, and I told Karl to “shoot quickly, below eye level…. SHOOT!” The shot rang out and the hippo dove and charged the boat under water. 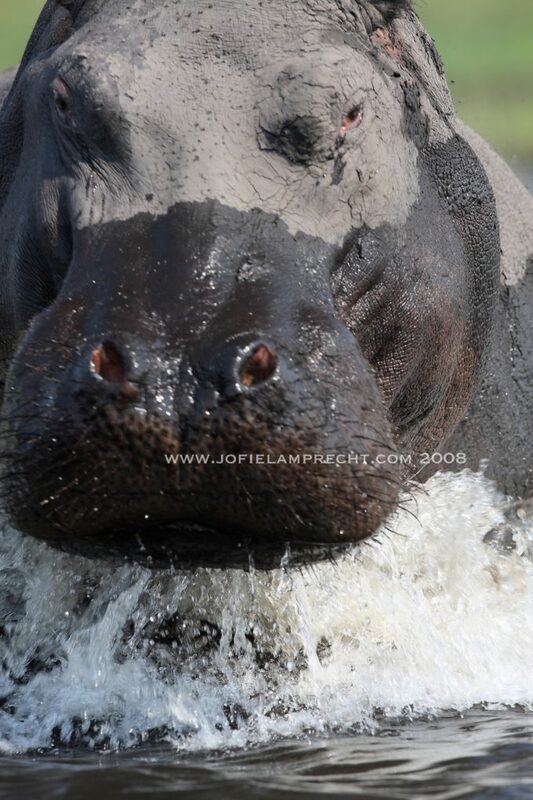 Knowing full well our bullets would not penetrate the water; we waited and watched the hippo closing the 30 yards in what felt like slow motion. I shouted for everyone to lie down in the boat to lower the level of gravity, to try and avoid capsizing the boat. As he drew near I could clearly see his open mouth under water, and held my front sight on him as he went under the boat. I told everyone to brace themselves, and be prepared for the impact. Nothing. I jumped to the opposite side of the boat where I could see bubbles once more, and waited for him to surface. Again I could see his huge head under the crystal clear water and waited. As he broke the surface, I fired, and down he went again. After much splashing and more bubbles, this mighty 2.5-ton animal was silent. Now the real hard work started. Churned up river bed settled, and the boat drifting, it was time for fast work to secure our quarry before he started rolling with the current of the river. An ingenious tool had been devised by Koos. Three-inch steel piping, in three-foot lengths, was screwed together until the correct length was achieved to reach the motionless hippo on the riverbed. A sharp “gaff” hook was now secured onto our “hippo-pole”. I had to see this to believe it, we then “gaffed” the hippo on one of his legs, and four men with full force pulled upward in a jerk. 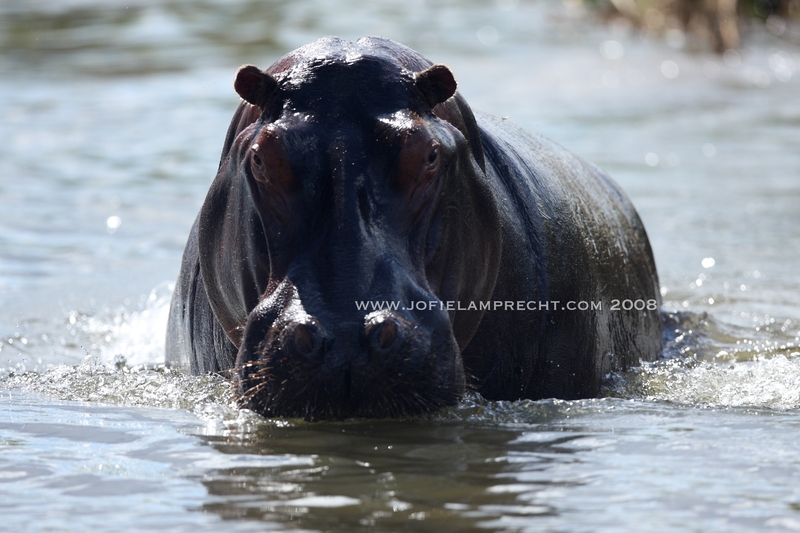 Instead of waiting the 20 – 60 minutes for the hippo to bloat and float to the top, and potentially losing him in the current, the hippo popped to the surface and slowly started sinking again. Incredible! His two hind feet were secured to the boat, and there was time for everyone to take a break for the above-mentioned waiting time for the hippo gasses to work their magic. Karl lit a smoke, and we sat back, slowly drifting down the Kwando, enjoying the aftermath of battle with the “most dangerous animal in Africa”. Karl made his shot at 13:30. It took us four hours to get him ashore, battling our way inch by inch with backbreaking toil. Dragging the dead weight upstream was slow, but relatively easy. Reaching the narrow channel that led us past the island of our tented camp into a swamp area – polling, rowing and after trial and error, backing the boat down these channels, took it out of all of us. Karl, the client, friend and engineer – 75 years old, with pocketknife in hand to clear the propeller of weeds every few minutes, was a great help. The rest of the hunting team and I strained on the poles and oars – fighting literally inch by inch to reach the shore. With a great team effort, we beached this giant beast to the jubilant shouts of the waiting local community who would party into the night with bellies full of hippo meat, with no activity other than eating and drinking locally brewed beer well into the next week. The trophy was a magnificent old fighter, with thick worn down tusks. Karl, however, could not take it home, because it was for a traditional festival. With stiff backs and weary bones we had a 5 A.M. wake up call to go look for buffalo. No good sign, but we did see reedbuck, zebra and giraffe. Karl and I returned the ranger boat, and had a relaxing cruise for almost two hours to the ranger station. Karl took the rest of the day off, and I went to check our leopard bait one and a half hours away. Good news, our Tom leopard is back, with a female! We made a plan to monitor the situation and get them nice and comfortable for the next few days before we made our next move. When we skinned the hippo, we had a look at the effect that Karl’s .375 Wesley Richards H&H 300 grain solid had on the head shot on the hippo. 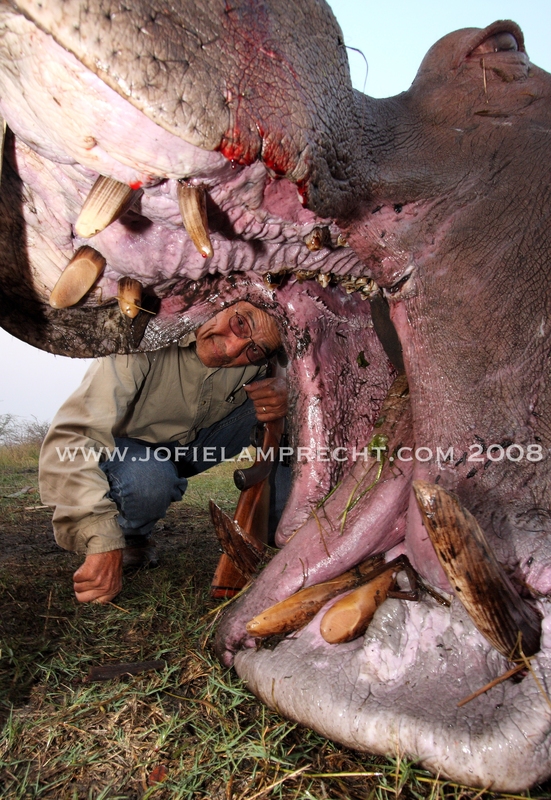 The bullet entered the skull off center, penetrated the inch thick skin of the hippo. The projectile knocked a three-inch diameter dent into the skull, before bouncing up and exiting the head of the hippo. Karl never got a shot at that leopard, Mr. Spots outsmarted us. Another client shot that same leopard a few miles from the Zambian border the next season, in the same bait tree. Curiously, the leopard was missing his entire tail! No leopard for Karl on this trip, but he did go home with a 75 pound elephant, good buffalo and the above-mentioned hippo. What wonders might tomorrow bring? I will miss you Karl. Rest well!